← National Park Kick: Happy Birthday Yellowstone! (L) Vineyards in the Colchagua Valley. (R) Loft Punta de Lobos in Pichilemu. 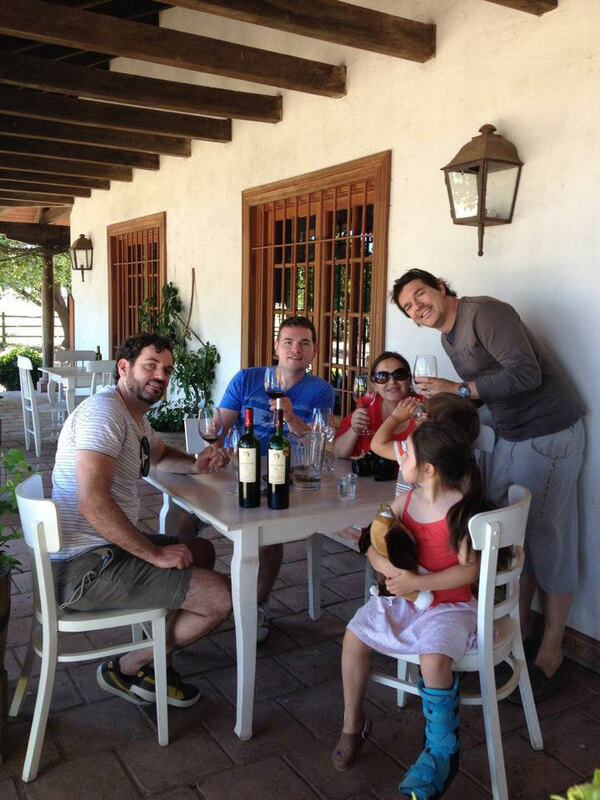 After starting our trip in Santiago, we headed south to enjoy some of the country’s famous wines. There are several viticultural regions in Chile, mostly in the central latitudes. Our destination was the Colchagua Wine Valley about 3 hours by car to the southwest. Heading south on the Autopista Central, the landscape gets increasingly green as you travel. To the right are the coastal range mountains and to the left rise the enormous Andes, a giant wall separating Chile from Argentina. The valley in between is a fertile agricultural region with fields of fruit production lining the highway. The next time you buy produce in the US in the winter check the label, there’s a good chance it came from this part of Chile. Sampling wine at Laura Hartwig Winery. At San Fernando we exited the main highway and turned to the west, taking local roads through small towns on the way into the heart of the Colchagua. Our first destination was Montes Wines, they make some great wines that we purchase in Chicago and wanted to check it out at the source. After some finagling with a committed gatekeeper, we were allowed entry and were served tastings on an outdoor patio with a beautiful view of the vineyards that extend up into the hillsides. An on-site restaurant offers hors d’oeuvres and there’s a gift shop for buying some bottles to go. Our accommodations for the night were at Hotel TerraViña, just outside of Santa Cruz. The hotel was actually built on land purchased from one of the neighboring wineries, so the grounds are entirely surrounded by grapevines. After a dip in the pool we headed to a nearby Italian restaurant called Vino Bello that is accessed via a picturesque path through the grapes. 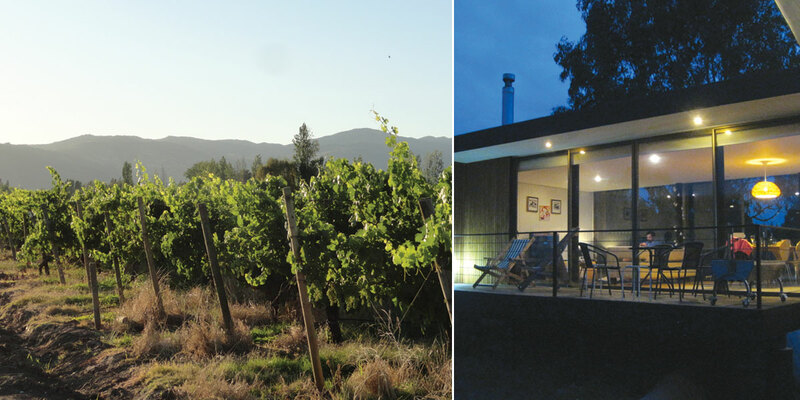 The second winery we visited was the family-owned Laura Hartwig, located just around the corner from Hotel TerraViña. Like many vineyards in the Colchagua Valley, they offer free horse and carriage rides around the property. It’s a fun way to check out the area and the kids love it. Since it was a light day for visitors we ended up getting a private tour from guide Cesar. It was probably the most informative wine tour we’ve ever taken and we got to sample some wine right from a tap of an aging barrel. After the tour Cesar set a table and we all got to enjoy four sample pours. Because of the wine shop on-site there’s a nice bottle of Laura in our wine cabinet waiting for a special occasion. Another good touring/sampling/dining option in the area is Viu Manent. We stopped there a few days later for lunch on the way back to Santiago. They also offer tastings, tours, horse and carriage rides and some seriously huge cuts of meat at Restaurant Rayuela. The great thing about the Colchagua Valley is that it is fairly new to the tourism scene. You don’t have to deal with crowds or traffic or schedules, it all has a very laid back vibe … much like Chile itself. Speaking of laid back vibes, after our stay at Hotel TerraViña, we drive another hour and a half through the beautiful Coastal Ranges to the seaside town of Pichilemu, South America’s surf capital. What makes the area famous is a site just south of town known as Punta de Lobos that creates consistent world-class surfing waves 2-3 meters high. This area is also experiencing an explosion in tourism, with tons of new beachfront and hillside vacation homes under construction. Many houses can be rented, like the one we stayed in, Loft Punta de Lobos. The ultra-modern three bedroom house can sleep up to 10 people, has a deck with a grill and views of the Pacific and Punta de Lobos from walls almost entirely made of glass. 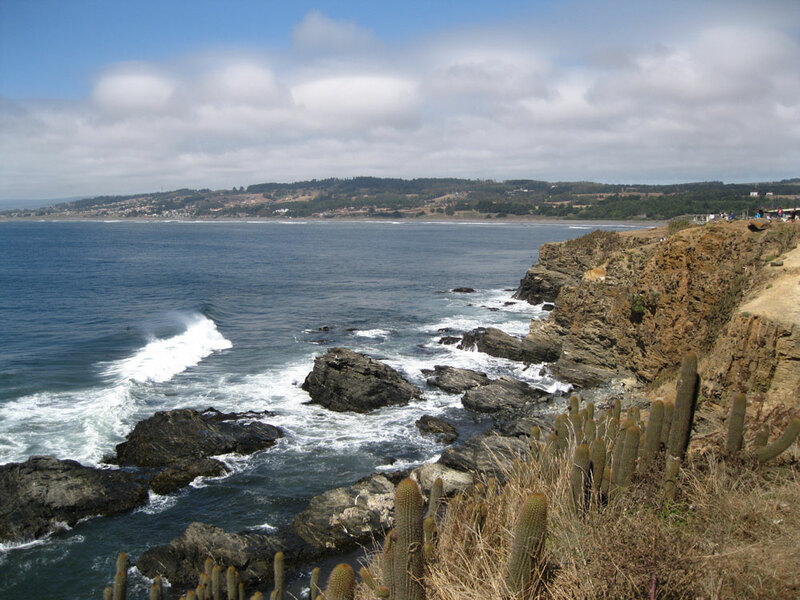 Just a short walk downhill led to the wide, black sand beach that lines the coast from Pichilemu to Punta de Lobos. It’s a great place to go for a stroll, build a sand castle or just lay in the late afternoon sun (it’s typically foggy in the morning) but those hoping to swim will be disappointed. With ocean temperatures in the 50s a dip makes for a rather invigorating experience. Since we don’t know when or if we’ll make it back to Pichilemu we dove into the huge waves just so we can say we did it. Crazy gringos. We had great luck dining in Pichilemu, enjoying some of our most memorable Chilean dishes while in town. From traditional machas a la parmesana at El Secreto to risotto in squid ink at La Loba to fresh fish at Puente Holandes, we loved every bite, and of course, pisco sours were always the start of each great meal. Up next I’ll give more details of our visit to San Pedro de Atacama in northern Chile. See more photos of our entire visit to here.